Every day is another day closer to Spring. And every day I keep watch for signs and portents that it is indeed on the way. Let me count the ways. The days are longer. Happens every year, and by now - 44 days after the solstice - all those additional seconds are adding up. This year there are even flowers in the garden, snowdrops and hellebores in bloom. There's no snow. Well, that's no surprise because this year we haven't gotten but one whiten the ground event. My neighbor's sheep are lambing. They're very sweet. Clean and white. Bouncy. 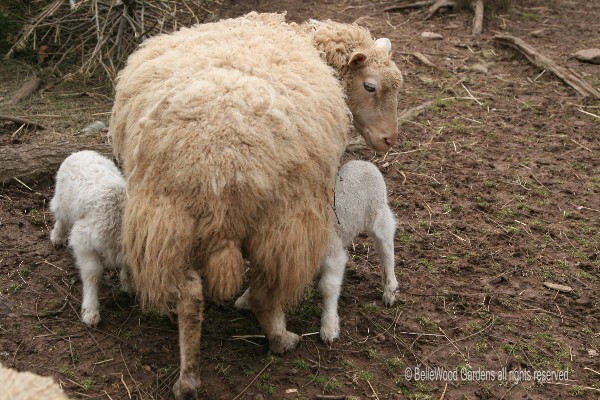 This ewe has twins. What do you think - shall we add them to the tally for Spring?